I have been playing this programming game and every time I thought I would stop playing I came back for more. * Shenzhen I/O is a game where you are assigned to build concepts for products. 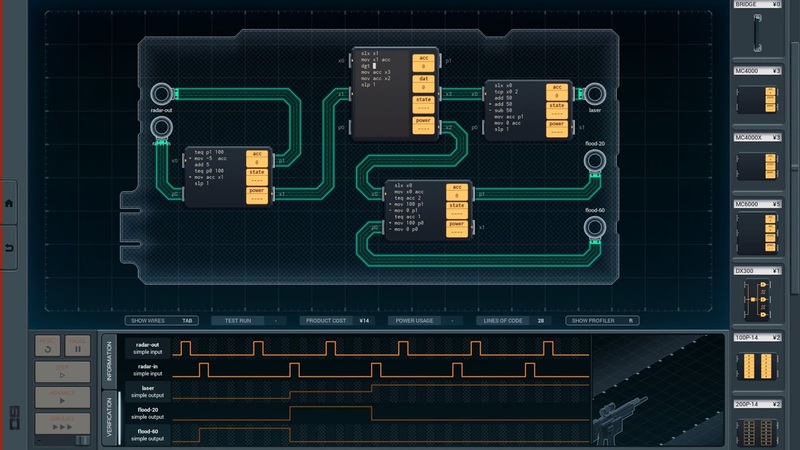 Use circuits and an in-game assembly language to solve the puzzles. One of the game's later puzzles. Measure the time between radar out/in signals to auto-adjust laser/flood settings on a gun. In my thoughts and summary on the game, my pros and cons centered around the game's audience. This game, with the right audience, is amazing. In general, that audience consists of players who enjoy logic, working, and the satisfaction of solving a puzzle (even if it takes a long time). Want more of my thoughts and/or comments on Shenzhen I/O? *In fact, that's one of the reasons this entry got posted late (on Friday instead of Wednesday).